Oh my goodness, these sound heavenly. 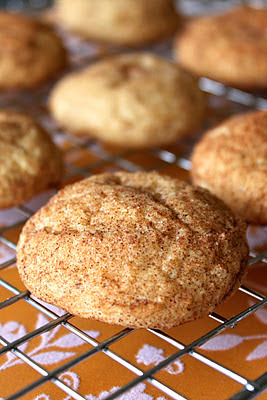 Snicker doodles where the very first cookie i learned how to make about 55 years ago. So i can't wait to have my Great Grandkids over to help me make these yummy fall - inspired cookies. I made these cookies tonight and only baked them for 8.5-9 minutes. I am delighted to say I absolutely LOVE these cookies!!! Biting into them is like eating a cloud!! Thank you!! I made these today. Awesome! I added a little more spice, chilled dough 45 minutes(kept chilled between batches) cooked exactly 10 minutes. Perfect! Fantastic! I'm in love with this recipe. Gotta try this for dinner. Thank you so much for sharing! You are killing me with your yummy cookies, Risa, I want to make them all! !